This gravesite is located off of Hwy. 99, just north of Hwy. 82 and across from Josie B. Road. According to a paper company employee, who has worked this particular land since the 1940s, there were only two stones here. One for Thomas Dover and the other for John Vickery. I have found both stones, demolished beyond repair, by careless bulldozing. One piece of Thomas Dover's gravestone is about 200 feet away, next to the highway. 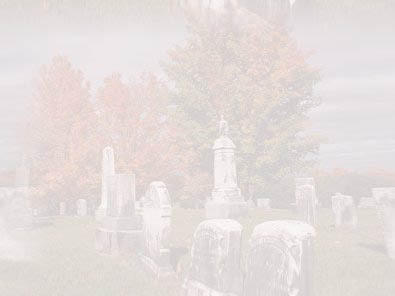 It is not known if there more gravesites here, but it is possible. There are many bricks laying around, maybe from a wall or other graves. This land was once called Dover Hall Plantation in the town of Bethel and Thomas Dover was it's very wealthy owner. At the time of his death, it is assumed from legal documents, that he did not have any direct heirs, and he left the 900 acre plantation and all of it's 71 plus slaves, cattle, and buildings, to his nephew William Dover Jenkins. From the pieces of the stone, I could read: "SACRED To the memory of THOMAS DOVER who departed this life June 13th 1845 in the 84th year of his age..."
The other stone, for John Vickery, reads: "IN memory of JOHN VICKERY...departed this life..." There was also a footstone with the initials "J.V." found nearby. Who John Vickery was, is another imponderable. According to Margaret Davis Cate's records, there were three stones out here, the two mentioned above, and one for a George March. 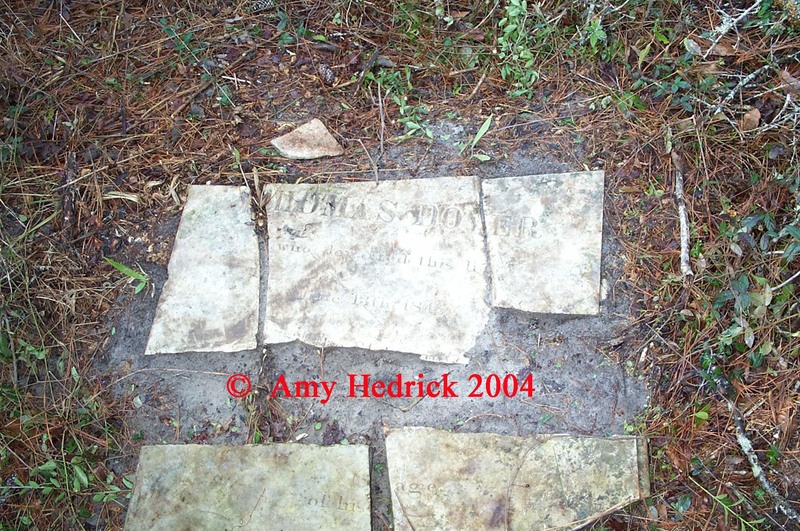 If her records are correct, then the stone I transcribed for Thomas Dover is in error concerning his age. Below are the transcriptions as recorded by Ms. Cate. 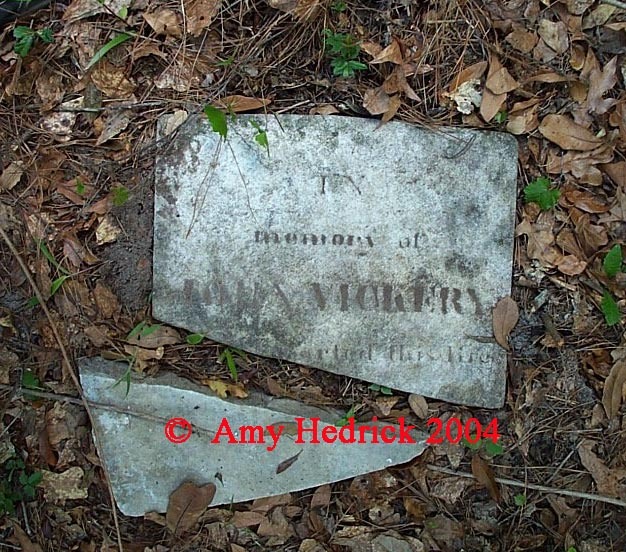 Cemetery surveyed fall of 2002.